real time sync, for orders, bank deposits, inventory and more! When an order is placed in WooCommerce, the customer, order and payment will sync immediately into QuickBooks! Same with product and inventory sync! Keep your inventory in both platforms completely in sync as we sync stock levels both directions between WooCommerce and QuickBooks - or just one direction...it's up to you! 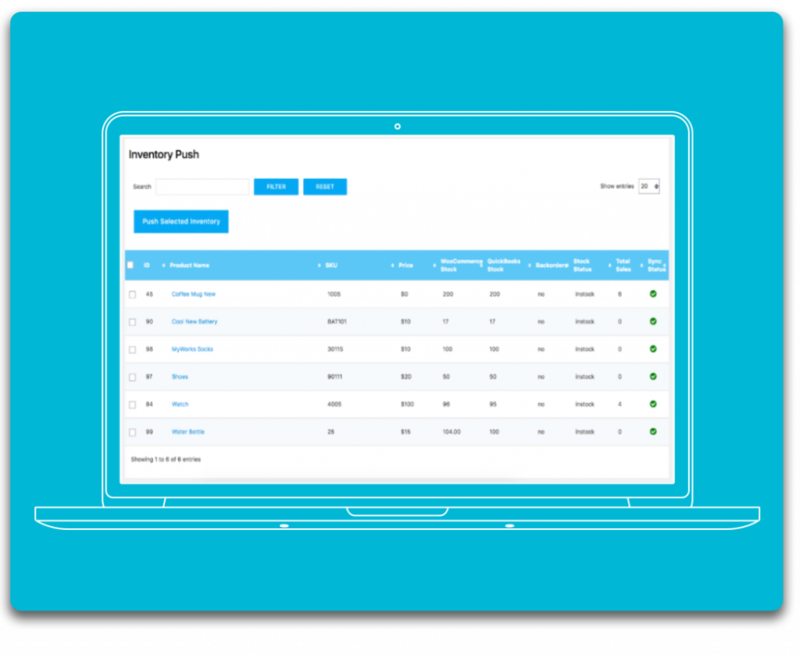 You may also manually push & pull data between systems, so if you need to push old orders to QuickBooks, or pull new inventory levels or products into WooCommerce - we have you covered! Completely control the way your data syncs to your preferences - with easy and flexible customer/product mapping and settings that allow you to control exactly what data syncs, and how it syncs. We include unlimited 24/7 support by email and support ticket with all our licenses, so in addition to our complete documentation - you can be sure we're here to make syncing go right! 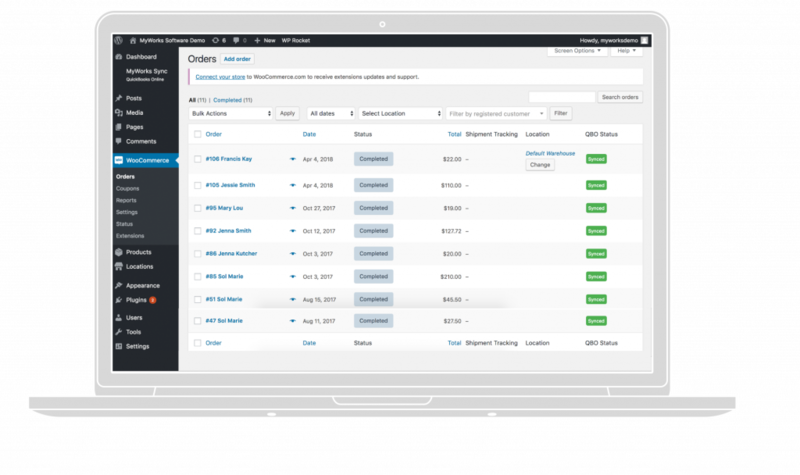 Sync your orders as invoices or as sales receipts, and sync manually or in real-time – it’s up to you. Customizable payment sync settings and the ability to turn data sync on or off for each data type let you control exactly when and how your data syncs. 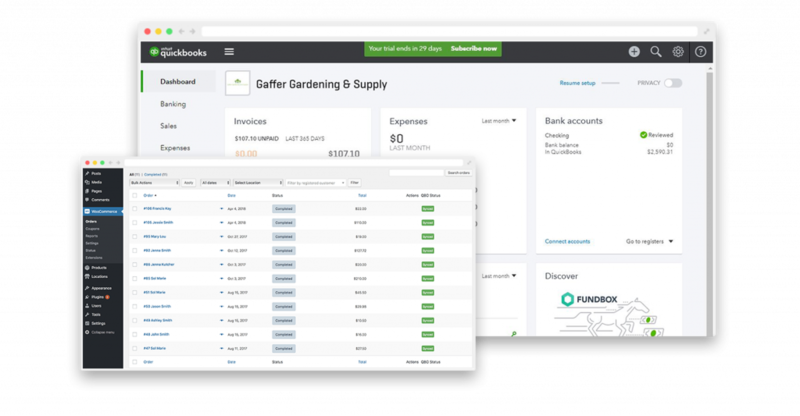 The integration allows you to seamlessly sync your orders to QBO as invoices or as sales receipts, either in real-time or manually. Individual sync switches allow you to easily toggle data sync ON or OFF for each type of data – customers, orders, inventory, payments, and more! You have complete control over what information syncs from WooCommerce to QuickBooks, as well as QuickBooks to WooCommerce! Map customers, products and variations automatically using your choice of fields, or manually match them up. The integration will sync your orders over to QuickBooks in real-time. As soon as the order is placed on your site, all the information will sync right into QuickBooks! For those that like more control over what syncs, we have manual push and pull options! In addition to accurately syncing over transaction fees to QuickBooks, our smart batch support will automatically create a bank deposit in QuickBooks for each days sales - to match your processor's deposit! We fully support all currencies, regions and tax rules. Wherever QuickBooks is supported, you can be sure our sync will fit right in! We have complete documentation to guide you through the setup... but we also offer a complimentary setup screens hare to guide you through it! The sync works in real-time, and you can also access past or historical data and sync it to QuickBooks. 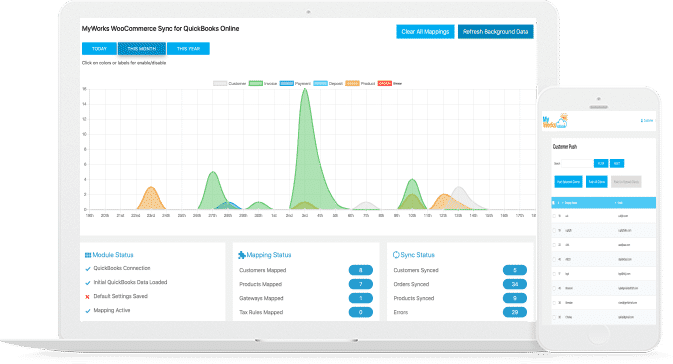 Whether you have a weeks worth of orders or several years of orders, the sync lets you easily catch up on your accounting. Our team is always here to help and support you. You may access our support system anytime and anywhere. Would you like a call? Just leave us your phone number! Read our 30+ 5 Star Reviews on the Intuit App Center! To save you some time, we’ve outlined what sets us apart from other solutions. Want more? Feel free to give us a call at (972) 505-3245! Our sales team is based out of the US and UK, so you may reach us by phone or live chat anytime! Check out our compatibility add-ons! We have additional compatibility with 20+ popular 3rd party WooCommerce plugins! Do you support product variations or bundles? Yes, our plugin fully supports product variations & bundles in WooCommerce! Sometimes I receive payments in cash or in person. How can I handle that? You can easily mark an invoice as paid either in WooCommerce or QuickBooks and it will sync over. I don’t want to sync all of my past data over to QuickBooks, do I have to? Not at all! You can choose what past WooCommerce orders you want to sync to QuickBooks; Either one by one, set a time period, or order history from when to sync. Can I sync data from QuickBooks into WooCommerce? Absolutely! Our plugin gives the the ability to sync from QuickBooks Online to WooCommerce, and WooCommerce to QuickBooks Online. Is there a way to know what data has been synced? There is! Just check the WooCommerce QuickBooks sync status indicator next to each type of data in our plugin, and you’ll be able to see if it’s been synced or not! Will products created in WooCommerce show up with their SKU and inventory synced to QuickBooks? Yes, they sure will, and when you create a product in Woocommerce, it will real-time sync to QuickBooks . Then if you edit the product or its inventory in QuickBooks – it will real-time sync back to WooComerce and Vice Versa. I don’t want to sync my data in real-time. Can I do it manually? Absolutely. Our WooCommerce plugin has simple settings that allow you to turn real-time sync with QuickBooks on or off, as well as turn real-time sync on or off for particular data types. How difficult is it to map/link all my data? 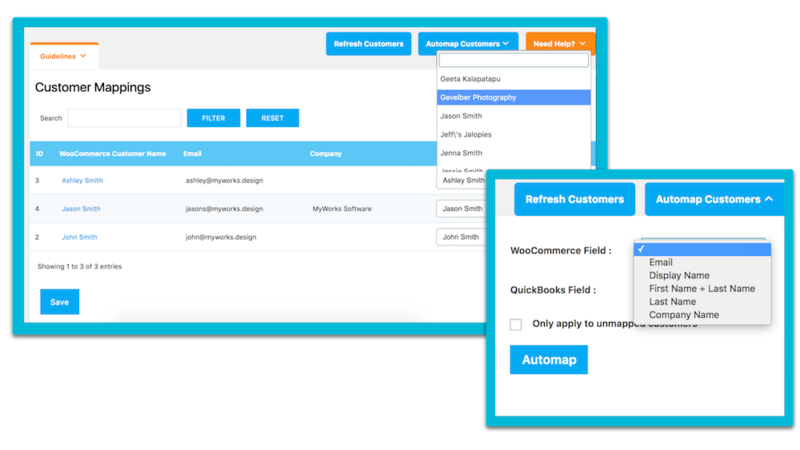 We give you full control over mapping (linking) your WooCommerce and QuickBooks data – with automapping built in to assist you. You can change the mappings at any time, and data doesn’t have to match – your product doesn’t need to be named exactly the same in both systems, for example. In addition, you will only have to map data that exists in both systems. As our software syncs across new data, like products or customers – it will automatically map it! If I have some orders already entered into QuickBooks will they be duplicated? Nope, the WooCommerce plugin will find them – it never duplicates. What countries does the plugin support? Our plugin is compatible with all versions of QuickBooks, including United Sates, United Kingdom, Canada, Australia, India – and any country where QuickBooks is compatible. The full list of countries that QuickBooks supports may be found here. Ready to get started? You can sign up for Free! What would you do with an extra 10 hours+ a week? Let us help you focus on what really matters to your WooCommerce business. While we automate your accounting, CRM and inventory, we'll be here 24/7 to support you - so you can get back to business!